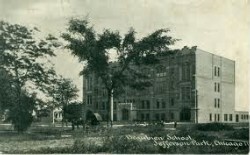 Beaubien School was originally named the Jefferson, after the small community it served in 1877 called Jefferson Park. Jefferson Park was annexed by the City of Chicago in 1899. The original school contained only four large classrooms. In 1905, a fire partially destroyed the school. A new school was built on the site and was named after the French trader Jean Baptiste Beaubien. The Jefferson Park community of Chicago grew rapidly in the early 1900’s and soon Beaubien School housed over 2,100 students. These students attended school on double shifts. Additions were made to the school in 1914 and 1928. The rooms on the three floors along Winnemac are part of these additions. In 1977 and 1978 Beaubien was modernized when the lighting was improved, the floors were sanded and refinished, and the bathrooms were remodeled. From 1899-2016, Beaubien has only had 7 principals. Former principals include: Mrs. O’Keefe, Miss Utter, Mrs. Phipps, Mr. Healy, Dr. Plain. and Mr. Chris Kotis. Mrs. Michelle Ludford is our 7th principal and would be honored to follow in the footsteps her predecessors lengthy tenures.